Designed and manufactured in combination with the Japanese vehicle giant, Toyota. The Dunlop Grandtrek TG32R has been given and an all season tread pattern, allowing traction and perfomance to remain unphased in some of the worst conditions. 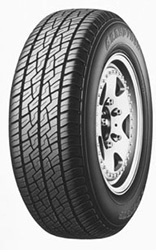 With comfort a factor throughout the Grandtrek range you can count on the Dunlop Grantrek TG32R to be no different.